« Should You Be Worried About Self-Driving Trucks? Truck drivers need to be prepared for all sorts of challenges on the job. If you’re just getting started as a trucker, you’ve probably already heard what a tough job it can be. Between the long hauls far from home, the stress of road safety, and the surprises each day on the road will bring, truck drivers need to be prepared for all sorts of challenges on the job. This can seem daunting at first, but if you stay focused on your goals and remember some simple tips, you will do just fine in your new trucking career. Here are 5 essential tips for new truckers to follow. Safety is always number one, especially in a career like trucking. You’re operating heavy machinery for long stretches of time, and the road can get tiring. It’s crucial to stay up-to-date on all safety measures. You should also be prepared for emergency situations. Keep a flashlight, first aid kit, toolkit, and hazard markers in case of any issues on the road. Getting started as a trucker can be intimidating, but it’s important for new truckers to keep in mind that experience will come with your time on the road. The more seat time you get, the better driver you will become. You’re not going to be an expert in your first year of trucking, but the expertise will come with time. One thing every new trucker should know is that training can be difficult. It will entail long hours with a trainer, sharing cramped spaces for exhausting, long trips. Make sure you’re prepared for a tough training period when you’re first getting started. It’s extremely important to prepare yourself for the difficulties of the road. Trucking can be a lonely, between the weeks away from home and the long hours alone in your truck. 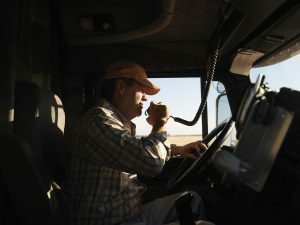 Remember to check up on your mental health while trucking, since the lonely hours can really take a toll. Lastly, remember to stay focused on your goals when starting out as a trucker. The beginning is the toughest part for any trucker, but the more you stay focused, keep at it, and build up your experience, you’ll be able to meet your goals and handle any curveballs a trucking career can throw at you. Be prepared for tough work and know that the experience and improvements will come with time. This entry was posted on Friday, January 25th, 2019	at 3:29 pm	and is filed under Trucking Basics	. You can follow any responses to this entry through the RSS 2.0	feed. Both comments and pings are currently closed.